NZ tourism is on a tear with no sign of slowing, driven by ever-higher numbers of Chinese tourists, right? 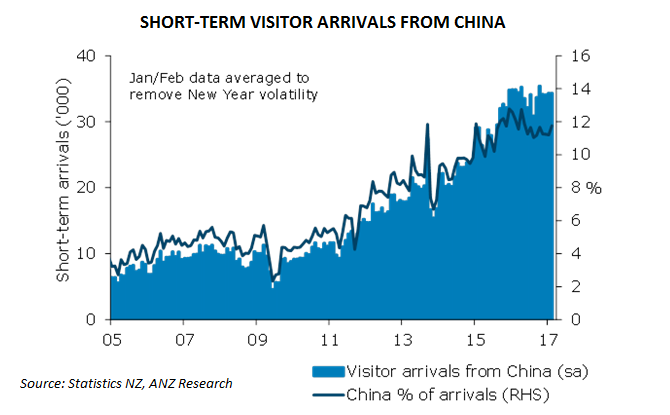 The trend in Chinese arrivals has flattened off markedly in the past 12 months. If it’s partly due to capacity constraints, the newly agreed lift in the weekly cap on flights to and from China could provide a second wind. When it comes to visitor arrivals, demand tends to follow supply. Visitors from China have been a major driving force behind a booming tourism sector and strong visitor arrivals growth. In 2010, China was the source of less than 5 per cent of NZ’s tourists. By the end of 2016, that share had surged to close to 12 per cent. Importantly, Chinese visitors spend around 35 per cent more on average per visit than the ‘average’ visitor, providing an additional boon to overall tourism sector earnings. More recently the pace of growth in arrivals from China has slowed. In fact, across January and February in 2-17, the number of visitors from China was down 1.5 per cent on the same period in 2016. While it is something to watch, more likely than not it reflects capacity pressures with regards to inbound flights. With the aforementioned lift in the weekly cap on flights from China to 59 (from 49) and the potential for a further 11 weekly flights to be agreed in negotiations later this year, it is quite possible we see a second wind. Elsewhere, the story for visitor arrivals remains an extremely positive one. The number of overall visitor arrivals sits at all-time highs, with ex-Chinese arrivals up 13 per cent year on year in February. There has been especially strong growth from Europe (13 per cent) and the US (28 per cent) of late. With the likes of the World Masters Games and the British and Irish Lions rugby tour this year, there are certainly factors that could see this strong growth for New Zealand continue. The biggest question is whether the county has the ability to accommodate the demand, although that is certainly one of the ‘nice-to-have’ problems.